Did you know that 88% of Irish businesses feel digital transformation will be their primary revenue driver in the coming years? Digital transformation is a hot topic for Credit Unions across the country who feel that they're struggling to keep up with the huge changes to the fintech landscape and demands of their members. It was for this very reason that in October 2018 we hosted the first cuEngage event at the Guinness Storehouse in Dublin. We centred the event on how embracing digital technologies can engage your Credit Union’s members, your staff, and your community - now and for the future. If you weren’t able to attend the event, or want a quick recap, we have compiled some key takeaways for you. After attending industry trade shows hosted by Money 2020 and the National Association of Federally Insured Credit Unions, Kevin shared his top takeaways from these (as well as insights from some of our Global Partners) that can be applied to Credit Unions. Expectations have changed when it comes to how people interact with their financial institutions. Fintech companies such as Stripe and WeChat offer new ways to move your money, increasingly putting self-service is at the forefront. Now more than ever it is important to offer members a user-friendly service that puts them in the driving seat. Almost all challenger banks now focus on a mixture of corporate social responsibility and making their users feel like they part-own the bank. Sound familiar? From planting a tree for paying your bills to getting you involved as an investor, modern banks are striving to create the ethos you’ve always had. It’s time for Credit Unions to take advantage of this! From planting a tree for paying your bills to getting you involved as an investor, modern banks are striving to create the ethos you’ve always had. Whether it’s your thumb, your voice, or your face, accessing your sensitive data from anywhere in the world is becoming increasingly intuitive. Companies like IDNow and IDScan (two possible partners for our future cuOnline+ developments) hold over 11 billion identities, meaning half the people on the planet are registered with more than one ID verification company. You can download a copy of Kevin's presentation here. For Ian’s presentation we held an interactive session exploring the areas that will support your Credit Union’s future strategy, and how Wellington IT can work with you to drive innovation, helping you now and in the future. 1. 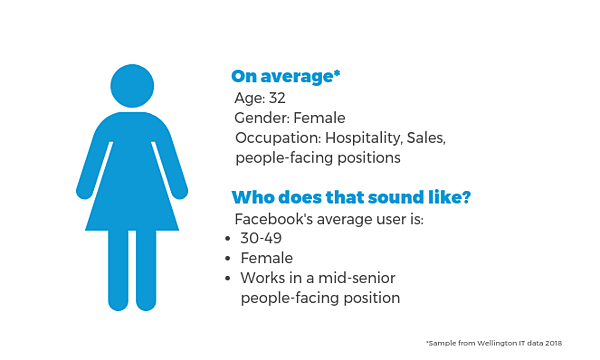 How do we engage our key demographic? Using a subset of anonymised customer data we found that, on average, 65% of new members took out loans from their Credit Unions in 2017. While this differs across Credit Unions, we asked if attendees really knew their own core borrower profile. If you don’t really know the answer, you’re not alone! Developing member profiles is a real struggle for many Credit Unions. The answer? Research. Research within your common bond. Research into the Fintech space. Research with your existing customer base. Did you know? There is a wealth of customer knowledge from your business intelligence software such as age, occupation, loan types etc. all of which can help you build up your member profiles. As a technology partner, in addition to speaking with our customer base, we are constantly looking at the wider Fintech market to identify trends that we can feed back into the technology that we are building. As a result, our product focus is on making it easy: easy to join a Credit union, easy to take out a loan online and easy to market your services to new and existing members. 2. How can we save time with improved processes? 2018 was a busy year for compliance, and on average transactions have become 4x longer. Compliance isn’t going away, so where can you get that time back? Encouragingly there are lots of ways that Credit Unions could save time on existing processes. The most notable way attendees identified was making a move towards a paperless office and getting your members to do more. On average, basic transactions have become 4x longer. Think about it. How much printing did your staff do yesterday? How long did it take? Tools like digital signatures at the counter, table-top scanners that automate cropping (so no need for manual processing!) and e-signatures help create a paperless office which drives efficiencies throughout your day-to-day. Attendees also discussed the possibility of cutting processing time by allowing your members to take back some of the steps in processes, for example getting the member to check through their own personal details, which becomes much easier with the introduction of tech like digital onboarding. 3. How do we get revenue from existing members? Getting someone to first join the Credit Union, then take out a loan can be a difficult sell – so how can you make the most of the members you already have? According to our data, member to loan ratios vary between 31% and 10%, with an average of 17% of members having taken a loan in 2017-18. The good news is that getting your existing members engaged doesn’t have to be rocket science – in fact utilising the information from the first two questions, you will be well on your way to implementing the rest! Ultimately, if you want revenue from existing members you need to make it easy for them to bank with you. With current accounts set to hit the market in early 2019, members can manage all of their money with you, rather than viewing you as solely a savings or loans provider. This opens up new possibilities attached to current accounts, such as fees and overdrafts. It also opens up the door for you to become their primary financial provider - if a member can do the basics with you, they’ll be willing to try to do more. Did you know? The total monthly value of debit card transactions rose by 6% from 2017-2018, totalling €5.8 billion. Current accounts could offer Credit Unions a real slice of the action! You can download a copy of Ian’s presentation here. Giovanni highlighted that while the Credit Union sector shows strong fundamentals, shrinking surpluses are putting pressure on their business model, as well as increased competition from other personal loan providers, he also made the argument that the evolution in consumer expectations opened up new possibilities for Credit Unions. He went on to explain how a CRIF will use a combination of the CCR, ICB, and smart data analytics to create a multi-bureau solution that will offer you a credit score for any member, meaning you can make lending decisions much more easily. Working with Wellington gives CRIF access to pooled data, meaning as people move across Credit Unions they can’t leave their debt behind. 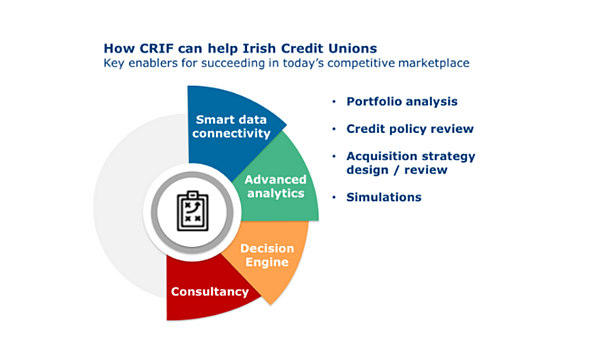 With CRIF, multi-bureau information, and pooled data, our customers can introduce a four step credit application decision, going from eligibility criteria to affordability, then on to a credit risk assessment (powered by CRIF’s decision engine) and final decision. You can download a copy of Giovanni’s presentation here. There is no Digital Strategy anymore, just strategy in a digital world. The final presentation from Sean Hosford at HSSCU focused on how a well-researched digital strategy can support continuous improvements in operational efficiencies and member services. The thrust of Sean’s presentation was how HSSCU got to grips with their market, and how that deep understanding allowed them to create a clear strategy for the future. To ensure this happened, in Spring 2017 as part of their strategic planning process HSSCU commissioned iReach to conduct market research on their membership. Online member surveys, in branch interviews and focus groups gave valuable feedback on their services, payments and loans, and online services. Overall the research showed a high level of satisfaction amongst Credit Union members, but also helped to identify areas that need further development, for example, despite members having a high level of awareness of their available online services, there was a low level of uptake overall. From this research HSSCU have been able to develop a member-driven digital strategy with clear objectives that center around what their existing members actually need. The Credit Union have identified 5 key objectives for their digital strategy. Increase their online activity through an awareness campaign. Introduce Digital signatures and e-signatures to members. Onboard new members fully online to offer a seamless experience. HSSCU truly take ownership of their digital strategy and we are delighted to be able to partner with them on delivering new member services technology. Encouragingly, they are already on their way to fulfilling their digital strategy with the adoption of new services such as digital signatures, e-signatures and online loan applications. You can download a copy of Seans presentation here. Check out the highlights from cuEngage in the video below. We hope to see you there next year!